The Historic Landmarks Preservation Center’s (HLPC) “cultural medallion program” will today hold a ceremony and place a plaque at the site of the Stonewall Inm to commemorate the Stonewall Rebellion” of 1969 on Tuesday, July 16 at 3 p.m. outside the bar, but the plaque created for the occasion was not reviewed by anyone who participated in the June 1969 uprising nor were any of its veterans invited to speak. The HLPC’s “cultural medallion program” – by a wealthy Democratic fundraiser, Barbaralee Diamonstein-Spielvogel, a former member of the New York City Landmarks Preservation Commission. Diamonstein-Spielvogel refused to discuss the event in advance of it or explain why Stonewall veterans were not invited to speak or involved in preparing the plaque’s text. Hoose added, “I’m so tired of that bar being glorified. It was this horrendous place where something great happened. 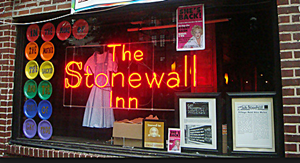 The idea for a plaque at the Stonewall came from out gay State Senator Brad Hoylman, who represents the Village area where the uprising took place. None were at Stonewall for the uprising. It’s a sad testimony to our history, not having the “vets” involved, even in a minor way. What is it about Barbaralee Diamonstein-Spielvogel? Is she homophobic?